If you do not see the answer to your question here, please call the Circulation Desk at 484-323-3839 or the Reference Desk at 484-323-3829. For directions around the library, check out our library map. Study rooms are available to check out for two hours on a first come, first serve basis - laptops are available for checkout as well if you are interested in connecting to the apple TV's that are available in each study room. Restrooms are located directly on either side of the elevator on the ground floor and on the second floor. There are also restrooms inside ImmacuLATTE cafe on the main floor. There is one copy machine in the library on the main floor near the printers. You can use your network ID and password if you haven't already set up your ID card to swipe. Copies are deducted from your print total for the semester. There is a scanner attached to a computer on the upper level. Click here for more details. There is a printer on each floor of the library. Printing is charged to your allotted account when you log into a computer. Each semester you receive 500 available copies on your account. When these have been used up, you can purchase additional copies at the Business Office for $.10 per copy. There is also a color printer that you can print to on the first which charges $.15 deducted from your account. The collection of popular videos (DVD and Bluray) is on the ground floor, these DVDs/Blurays can be checked out for 7 days and cannot be renewed. There is a $1.00 a day late fee that will accrue when the items are overdue. These videos or DVDs are located on the second floor at the top of the main staircase. Education dissertations are dispersed through the library according to their subject matter as well as online in a PDF format. Psychology dissertations are grouped together on the lower level behind the CD collection, and Nutrition theses are grouped together on the lower level behind the CD collection as well. Current newspapers are located on the table in the center of the lounge area on the main floor. The New York Times and the Wall Street Journal are available for check out at the circulation desk. Older newspapers are located on the second floor and are kept for 3 to 6 months depending on the paper. Is located behind the circulation desk. If you have misplaced an item just ask the circulation staff and they will be happy to look for you. The library has 12 wireless laptops for checkout and use in the library. They are available for 2 hours at a time and renewable once. Your student ID card doubles as your library card. ID cards are available from the One Card Office located in Room #7, Terrace Level, Nazareth Hall. Information on printing from your laptop? As a student, faculty, or administrator, Immaculata allows for you to bring your own device and print on the campus printers. The Print Manager Plus application enables printing on campus, manages your print account balance, and tracks your print history. Use the following instructions to begin using the printer from your laptop. Go to IT Student Handbook (you will be prompted to log into MyIU first. There is one copy machine in the library on the main floor near the printers - you can login with your user name and password or set up your ID card so that you can swipe the card for access to the copier. When these have been used up, you can purchase additional copies at the Business Office for $.10 per copy. There is also a color printer that you can print to on the first which charges $.15 deducted from your account. Each semester students have 500 pages allocated to their print account. Prints may be used at any open printer on campus. A confirmation will pop-up each time a print job is needed. The confirmation will show the total pages in the current print job as well as remaining balance in account. More information is available at the circulation desk. When these have been used up, you can purchase additional copies at the Business Office for $.10 per copy. There is also a color printer that you can print to on the first which charges $.15 deducted from your account. 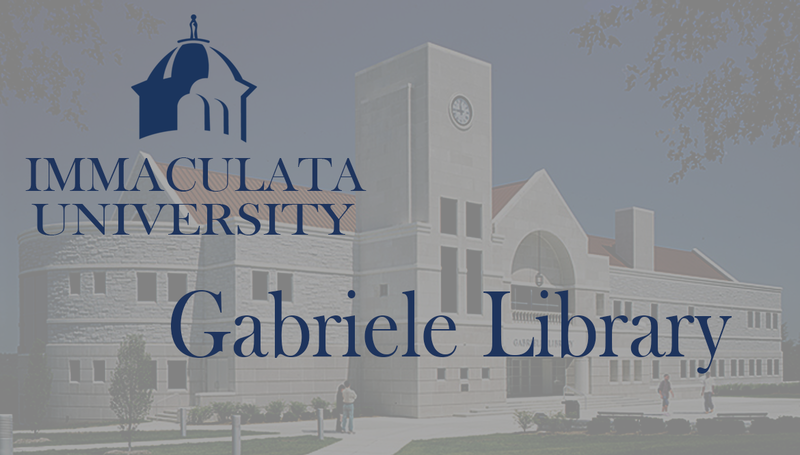 Gabriele library has a collection of online information to help you cite sources for your papers. You can find the information here. For summer hours and more information. Most library items can be checked out to students, faculty and staff on average for 5 weeks with the exception to items such as DVDs, CD's, Reserve items, etc. For more information on borrowing policies and library fines. There is no longer a computer lab in the library, but there are computers for use on all 3 floors as well as other locations on campus. For more information.